What are studio monitors and why do you need them? Studio monitors are speakers that are designed to enhance the audio reproduction of recordings. Studio monitors are usually designed for professional audio production applications. These applications include filmmaking, radio studios, recording studios, television studios, and home studios. Studio monitors are more of a physical robust as compared to the home loudspeakers. Home hi-fi loudspeakers can only reproduce the compressed commercial recordings while studio monitors have to cope with the sudden bursts and high volumes that can happen in the studio. These sudden bursts and high volumes usually happen during playback of un-mastered mixes. Audio engineers use the loudspeakers for the purpose of assessing the aesthetic merits of the program as well as to ensure the balance by mastering and audio mixing. It is also required that the loudspeakers be at various points so that the engineer can ensure that the program does not have any technical defects. These technical defects include background noise or audible distortion. The main difference in using a studio monitor and other external speakers is the ability of one to be attentive to precision. Whenever an audio engineer listens to a mix, he must be able to know what is there or else the mix will not work well. If a mix is bad, it is possible that it is only bad in one specific system and not in another system. In knowing about studio monitors and their purpose, one should be critical in when listening to see if the mix sounds good. Studio monitors help with the critical listening. It is not normally apparent when talking about the difference between studio monitors and other external speakers. Studio monitors are also speakers but they provide a different kind of sound as opposed to that of other external speakers. Studio monitors go to great lengths to enhance the sound and project it in a very short distance. This will prevent the room from enhancing frequencies. While speakers can provide you with a sound that is evenly dispersed, a studio monitor can provide you with an unadulterated sound. In terms of purpose, speakers provide the listener a finished state of the sound while a studio monitor provides a “clean drawing board” allowing you to build and create music mixes. Studio monitors come in a wide range of colors, sizes, shapes, and price points and for those who are interested in doing home recordings, consider looking into headphones. Studio monitors are used for serious, professional audio work. However, keep in mind that there will be differences between the two. Headphones are a good way to keep tabs on your mix. If you are a beginner, it would be advisable to start with headphones before moving on to studio monitors. While the quality of the music signal differs a lot, headphones can be good if you aim for a closer perspective on the sound. Studio monitors, on the other hand, let you achieve the desired accuracy for your sound. With studio monitors, you can really hear everything. As compared to the headphones, studio monitors will not give you a pretty nice sounding mix. Instead, it will give you the dirt that is actually present in your sound. A near-field studio monitor is the most popular among studio monitors that are available in the market today. Near-field studio monitors are situated only a few feet away from where the listener is. By doing this, you will be able to eliminate the reflections from walls in the room. You can actually hear what is going on. While the near-field studio monitor allows you to get close to the sound, there is a setback to having the small studio monitor. Smaller studio monitors provide a limited bass response. If you choose a small studio monitor, you may want to get your hands on a subwoofer. Subwoofers take care of the low-frequency sound. Studio monitors give you a flat frequency, a “clean drawing board”, it lets you hear what is really there. Its main focus is to avoid the artificial boosting of the treble, bass, and other frequencies. 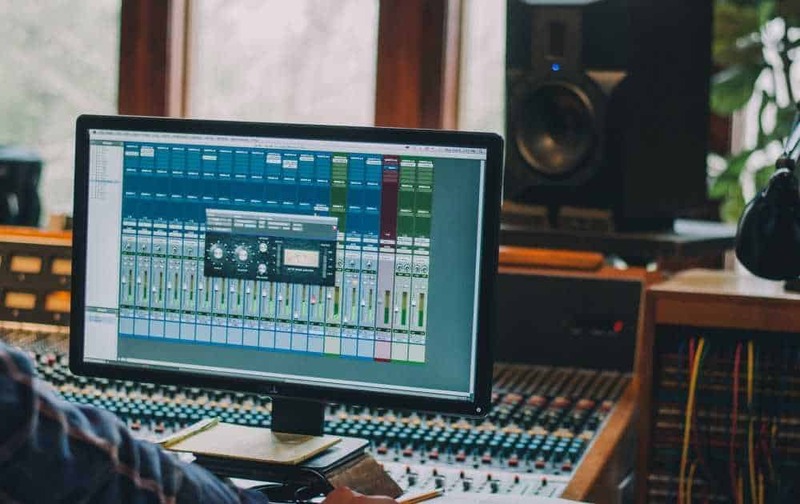 This artificial boosting makes the music sound good and as an audio engineer, you need to be able to accurately hear everything, not just the finished state of the music. Studio monitors can help you achieve this.